Mustansar Randhawa — a well-known organizer of power loom workers across three Punjab districts in Pakistan: Faisalabad, Jhang and Toba Tek Singh — and his brother were shot to death July 6th. They were killed by hired gangsters who sought them out at the Labour Quomi Movement office and killed in cold blood. Please sign on to the urgent action put out by the Asian Human Rights Commission. It details the situation of the power loom workers, whose bosses feel they can intimidate the work force and face down any government or union official daring to take the side of workers. The Asian Human Rights Commission (AHRC) has learned that a trade union leader and his brother have been gunned downed by unidentified men during strike negotiations. Mr. Mustansar Randhawa was leading protests against low wages, poor working conditions and the intimidation of workers in Punjab power loom mills, and had been engaged in state-led mediation with the owners just hours before he was shot dead outside his office. The deaths have added to the environment of intimidation faced by labour activists and human rights defenders in Pakistan, and the government must offer reassurance and protection through the conduct of an immediate, thorough investigation and the prosecution of those proven responsible. The Labour Qaumi Movement called its latest strike on 5 July. Led by District Coordination Officer (DCO) Mr. Saeed Iqbal Wahela, representatives of the owners of the power loom factories met those of the striking workers, including Randhawa, on the same day. At approximately 1.30am we are told that the DCO closed the meeting until the next day, and that Randhawa and his associates agreed to call off the strike until a conclusion was reached. Later that morning Randhawa held a meeting with strikers at his office in the Small Industrial Estate on Sargodha Road in Faisalabad, until shortly after 12 noon. We are told that most of the workers then left the office, and that Randhawa’s elder brother, Naseer Randhawa, arrived to meet him. Witnesses report that a car carrying two persons then stopped outside the office and a gunman opened fire on the two men with an AK47. Both brothers died on the spot; an office secretary was able to take cover in an adjacent room. The attackers, who remain unidentified, fled the scene. There are currently concerns that a thorough, immediate and impartial investigation may not be carried out due to the influence wielded by the power loom mill owners in the province. This would be damaging both to the owners, who stand popularly accused of arranging the crime, and to the unions in the district, which already operate in an environment of impunity and intimidation, and feel unprotected by the government. The workers have resumed their strike in the three districts, and are demanding that the matter be credibly and quickly taken up by police. There are around 250,000 power loom factories in Faisalabad, Jhang and Toba Tek Singh, supporting more than 600,000 workers. During the 5 July strike unionists demanded a wage increase of 17 percent, which would bring it in line with recommendations made by the Minimum Wages Board. Owners expressed reluctance to increase the wages. Randhawa was also a leader for the districts textile workers in the National Trade Union Federation (NFTU), where he had was successful in working through various negotiation breakdowns. Please write to the authorities below reminding them of the responsibility to protect human rights defenders and union activists against intimidation, and to thoroughly investigate crimes against them. The AHRC has written to the Special Rapporteur on the situation of human rights defenders calling for intervention into this case. 1. 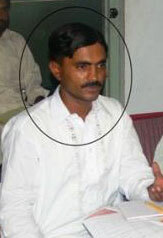 Mr. Mustansar Randhawa, 35; founder of the Labour Quomi Movement, and a leader in the National Trade Union Federation (NFTU), working at the small Industrial Estate, Faisalabad, Punjab. I am writing to express my deep concern about the daylight murder of a trade union leader and his brother during strike negotiations. The deaths have added to the environment of intimidation faced by labour activists and human rights defenders in Pakistan, and the government must offer reassurance and protection through the conduct of an immediate, thorough investigation. I am told that Mr. Randhawa, was a well known organizer of power loom workers across three Punjab districts: Faisalabad, Jhang and Toba Tek Singh and had formed the Labour Quomi Movement, as well as leading textile workers in the National Trade Union Federation (NFTU). Many of the workers he helped to organize work for less than the minimum wage and without benefits, and have reported victimization from violent thugs in the area near the LQM office, in the form of beatings, extortion and fabricated cases. The aggressors reportedly operate on the estate grounds with impunity, and claim the patronage of the mill owners. Randhawa had spoken of being threatened and intimidated by mill owners and their supporters during the past few years. The Labour Qaumi Movement called its latest strike on 5 July, and organizers met with representatives of the owners of the power loom factories that day, led by District Coordination Officer (DCO) Mr. Saeed Iqbal Wahela. I am told that the meeting was going to be continued on 6 July, and that beforehand, Randhawa held a meeting with strikers at his office in the Small Industrial Estate on Sargodha Road in Faisalabad, until shortly after 12 noon. Witnesses report that a car carrying two persons then stopped outside the office and a gunman opened fire on Mr. Randhawa and his elder brother, Naseer Randhawa with an AK47. Both brothers died on the spot; an office secretary was able to take cover in an adjacent room. The attackers, who remain unidentified, fled the scene.